My Christmas pudding (which turned out beautifully, by the way) was my first attempt at a steamed pudding. I set my heart on trying a steamed sponge pudding next. Pudding Month needed a chocolate recipe, so steamed chocolate pudding became my goal. As I hadn't made a sponge pudding before, I decided to try making a recipe from a cookbook as written. I ended up with a pudding that slumped heavily onto the serving plate, cracking open to let the raw centre flow; a bowl of gluey, excess batter and a heap of chocolate-streaked washing up. After such an inauspicious start, I decided I had to go back to the basic components of pudding. "Let us seriously reflect of what a pudding is composed." Though he would not have been referring to a steamed-in-a-basin sponge pudding (as the method changed in the 20th century), Dr Johnson "indulged in a playful fancy", recorded by Boswell in his Journal of a Tour to the Hebrides (1785), of writing a 'Meditation on a Pudding' after ridiculing a passage about the moon in Hervey's Meditations (perhaps here or here?). You can read it in full here. According to the Oxford Companion, a sponge pudding is composed "from equal weights of flour, butter, sugar and eggs, and steamed in a basin". I swapped some of the flour for cocoa powder and added a bit of greek yogurt to loosen the mixture to dropping consistency. I was really pleased with how it worked, though I overcooked the first one (though, really, it didn't make much of a difference). After a few experiments I hit on the right steaming time and a dash of coffee to liven it up. I bought a 14cm/5.5" enamel pudding basin for my Christmas pudding and I love it - it's attractive, cleans easily and feels like it will last for ages despite being reasonable (you can get it on Amazon here). A 12cm one would also be good - this recipe only fills 2/3 of the 14cm so it wouldn't need changing. The 14cm one takes about 750ml. Now I've got used to it, I've realised that steaming is a lovely, homely way to cook a pudding. It's especially useful if you've got lots of trays in the oven for the main course or - gasp - don't have an oven. The batter becomes a light cocoa sponge - it's not heavy or stodgy - and the sauce is a silky, pourable milk-and-cream ganache. The sauce sinks into the sponge, the ice cream melts, the three meld and you have a rich and very pleasing pudding. Carefully butter a 12-14cm (roughly 5") pudding basin, using plenty of butter so the pudding doesn't stick (I wasn't careful enough with the one in the photos). Place a circle of parchment into the bottom and grease it too. Cream the butter and sugar together. Sieve the flour, cocoa powder, baking powder and salt into the bowl then add the egg, yogurt and combined coffee and water. Beat just until the mixture comes together. Transfer to the buttered basin and level out. Crease a fold into a sheet of parchment-lined foil or a piece of baking parchment and a piece of foil and place over the top of the basin. Secure with a rubber band or a piece of string. Pour plenty of boiling water (I use at least 3 inches after it boiled dry the first time) into the bottom of the steamer then place the top half with the pudding on top. Place over a high heat to bring back to the boil then turn down to medium-low and leave to steam for 45 minutes. While it steams, make the sauce. Chop the chocolate into small pieces and place in bowl. Combine the cream, milk and sugar in a small saucepan and heat until steaming and starting to bubble at the edges. Pour over the chocolate and leave for a few minutes then whisk until smooth. Transfer to a jug. Take out of the steamer and remove the toppings. Check the sponge is cooked by inserting a cake tester or toothpick into the centre - it should come out cleanly. Loosen the sides of the pudding from the basin with a blunt knife. Place the serving plate on top of the basin then flip over. Lift the basin and peel the circle of paper off. Pour some of the sauce over the top of the sponge then let everyone add more to their bowls at the table. If the sauce has cooled and thickened then re-heat by placing the jug in a saucepan of hot/just simmering water and stirring until thin (you can do this if you have any left, too - both can be kept in the fridge but the sponge isn't as nice as fresh when reheated). Serve with vanilla ice cream. Pudding month is such a brilliant idea Emma! I love steamed puddings although it's been a while since I've made one - chocolate is always the best! Mmm, looks delicious. When I was younger, my mum would occasionally make a chocolate steamed pudding when we had 'soup and pudding' days (when she'd run out of cooking ideas!). She would make a milky chocolate sauce to go with it, and my sister and I would mix it all up and create a big mushy bowl of goodness! It tasted amazing! Maybe it's time I tried a steamed pudding for myself! Oh man, this looks lovely!!! Ah this brings me back to old fashion cooking! Steaming is such a lovely way to make desserts and it really should be used more. Who can resist that tender chocolate crumb? Not me! Thank you for doing all this recipe testing, so that I can go straight to making (and thoroughly enjoying) this chocolate pudding. Looks fantastic. Oh my gosh, this looks like just my kind of dessert. I'm drooling over the picture of the sliced sponge! I'm definitely going to have to try this one. Thanks Emma! This looks SO inviting, Emma. I blog on healthy recipes - mainly vegan - but I do like a good pudding every once in awhile. You are my go-to blog for such treats. Bookmarking and pinning! Few people outside England know how to make pudding and the bit of information about the equal parts of butter, sugar and flour is invaluable. One question: does it matter if you put the basin directly onto the bottom of the steamer? I wasn't 100% sure so I placed a rack at the bottom of the steamer. Also: do you add water up to the level of your pudding batter? Thank you in advance! Oh, this is just squidgy chocolate deliciousness. I must get over my fear of steamed puddings because this sounds exactly my kind of dessert. Any cake soaked in sauce - especially chocolate sauce - is good in my books! I've never been able to master a steamed pudding, but I'm going to try it again because this looks so heavenly. Thanks. I'm so pleased that you like pudding month! I hope you do start making steamed puddings again - I think they're great. I can just imagine the mushy-chocolatey-soup you could make by doing that - such a lovely memory, thank you for sharing. Do try making one - apart from anything else, it's an adventure! Thanks - it really is a lovely bowl of chocolate. Heh! I hope you try it - it's great fun. I agree - it's a great technique, I wish people used it more. I'm definitely going to keep experimenting. My pleasure (after all, I got to eat loads of chocolate pudding...). Hope you enjoy it if you do try it - let me know! Thanks Rana - I'm glad you like it! Do let me know what you think if you try it. I'm so pleased that you think of Poires as your go-to for these things! It's nice to have some balance. Do let me know what you think if you try it. Ooh, chocolate orange... maybe even Seville? I haven't had anything chocolate orange for ages. & you should definitely try it sometime, it's a great method. I have a two part steamer and so I placed the basin on the bottom of the top half. I haven't tried or looked that carefully into the directly-in-the-water type of steaming but I imagine you pour water up to the level of the batter (as long as it's not too full, maybe?). Glad you like it, Sophie. I found that even when I overcooked it this one didn't dry out - the yogurt helps a lot with that. I promise they're not scary (well, as long as you don't try the recipe I tried first...). It's an adventure! I hope it works out for you! Do let me know what you think if you try it. Ooh, yummy! I've never tried making a pudding like this, but I'm encouraged to try now that I can see how easy it is. Thank you! I'm just tipping over the too-much-pudding boundary after one month, I need a break! I'm so pleased you like the blog - I look forward to having a look at yours in a minute. Heh, fair enough! Let me know what you think. I made it last night, to celebrate the purchase of my Kenwood chef! It was delicious, and a huge hit with my office-mates! Sorry I missed your comment earlier. I hope your mum enjoyed her birthday cake? I'm British and have always lived in Europe, so I have always used metric. I believe it is a superior system to baking by volume so I'm afraid I will never provide cup measurements. I've written a bit more about it in my FAQ. Hope that helps. It does smell wonderful, doesn't it. I haven't come across that book - I'll have to look it up. I know the coffee seems a bit odd but it does lift it - glad you gave it a try! I'm so pleased you all enjoyed it! The ice cream sounds like a lovely idea. I'm glad you liked it. Personally I found that 1/2 tsp is enough to make it into salted caramel but I'm glad you enjoyed it - the salt is definitely worth adding. It's a great cake. I'm the same, except everything is served with tea! Sounds lovely. Good to hear the sour cream worked - thanks for letting me know! Love that. It's even better with a bit of orange in it or some booze in the sauce. Hi Emma, thanks for amazing inspiration. Just made this for a housewarming party I'm going to tonight - will let you know how it goes down! Would flaked almonds be the same as sliced almonds in the states? Thank you for a lovely recipe! I completely lived off this cake at the Vaults last Michaelmas so was really pleased this came up in my google search to recreate it! The cake itself is delicious, but it needed an hour and a half in the oven before it was sufficiently cooked, which resulted in a completely burned jammy bottom - but that's rubbish college ovens for you. I'll definitely make this again, but I'll leave the jam at the bottom out during term-time! Aw, no, that's a shame! I was lucky with my college oven I think (though we didn't get access to any in first year at Jesus). It might be worth getting an oven thermometer - I have this one - dodgy ovens are often at the wrong temperature/the dial isn't working properly. I guess you could also put the jam on top of the cake before baking - it'll sink through a bit but hopefully wouldn't burn. I'm not sure - do sliced almonds look like the ones in the pictures? They need to be thin ovals - only a millimetre or so thick. Hope that helps. WOW just found another recipe I want to try!! Just made this, thank you Emma - I found the recipe in the Telegraph online. I made it with an organic blood orange curd I had knocking around, which is hard to describe but is more of an orange spread than a curd. Anyway it came out really well. 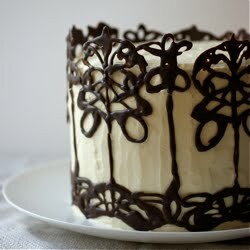 The milk seems to make it nice & moist and the layers of jam really get the flavor through the cake. Blood orange curd sounds like a lovely idea! So pleased you enjoyed it. I have been drooling at this picture for quite some time. I have not seen it in Singapore's bakeries and decided to try this recipe last night. I burnt the almonds and overcooked the caramel. In spite of all that, the cake turned out irresistibly yummy. I am going to try it again next week. Your detailed photos helped a lot. Thanks for generously sharing the recipe and steps! Great cake. Really easy to make if you ignore the pretentious over-the-top instructions. The first time I made it I carefully folded everything in as per instructions. Second time I just kept beating as I added flour, milk and butter. No difference in outcome. if anything, second cake was lighter. Next time write the recipe so busy every-day cooks won't be put off. Thanks for the ideas though. It's lovely to hear that you like the cake. I'm sad that you found the recipe pretentious as I try hard to make my recipe instructions accessible to everyone with enough detail to help new bakers and get consistent results. I believe that the technique above (which is the traditional way to combine a foamed cake mixture) is the best method but it is, of course, up to you how you make it. I'm glad you enjoyed it, Pauline. Did you end up trying it again last week? I made the cake today and it was gorgeous! My husband who doesn't have a sweet tooth and a friend who usually doesn't like almonds both declared it scrummy and proceeded to polish off half the cake (with some help from me and another friend)! I had to bake the cake for an extra 10 minutes to get a nice golden brown top. Otherwise, everything else in the recipe went to plan. I also used a springform tin so that I didn't have to flip the cake over and lose any of the almond topping. I'm so pleased you enjoyed it! I use a tin with a removable bottom too, it's definitely easier. "The only difficult part is persuading yourself to leave the topping alone" :D:D:D Lol... Just impossible! ;-) I am now waiting for it to get cold! Many thanks for the recipe. I had something similar at a cafe in Germany (but with apple filling in the middle and some kind of almond crunchy crust) and have been dreaming about it ever since! :D I'll be checking the rest of the recipes! Thanks! As an avid cookbook collector and baker I have never heard of this baking book but I did look it up on the Bookworld website here in Australia and they do stock it so it looks like I will be ordering it. dry fruit also. Get other variation in the cake at online shop of monginis. poires, are they healthy to our health? i have one serious problem with this recipe: i find myself with a gap between when i finish making the topping and when it goes on the cake... how am i not supposed to just have at that stuff with a spoon?! its too good! other than that, i love this recipe - a lovely, light, sweet cake. Thank you! These 3 researches from large medicinal journals are sure to turn the conventional nutrition world upside down!